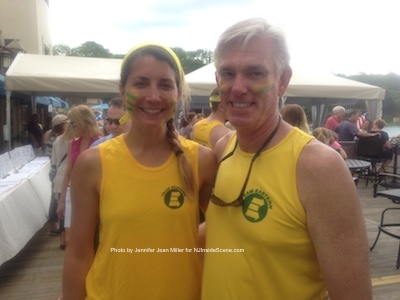 Alexandra Miller (left) and Rob Nicholson (right) of Team Eastern on the Boardwalk during the event. Photo by Jennifer Jean Miller. 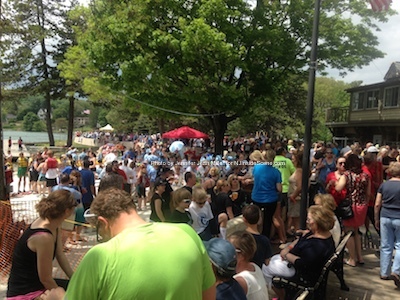 SPARTA, NJ – The inaugural Dragon Boat Festival took place on Lake Mohawk on Sunday, May 17. Clouds intermittently scattered the skies throughout the day, but neither dampened the event nor the spirits of the event goers, who packed the Lake Mohawk Boardwalk to participate and watch. The festival benefitted the Sparta Education Foundation (SEF), which is the non-profit arm that helps to fundraise for the Sparta Township Schools. The art of dragon boat racing originated from Hong Kong about 2,300 years ago with 46-foot boats with 20 people seating capacity. A drummer sits at the head of the boat to keep the beat and the paddlers row the boat forward in time to the rhythm. Each person on the boat works in tandem with one another to propel the boat forward. 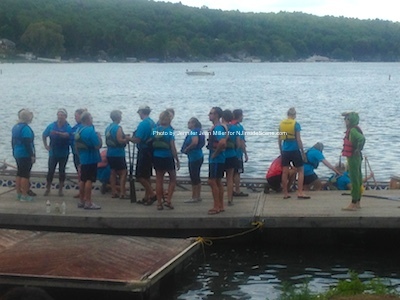 A team readies for their time in the water. Photo by Jennifer Jean Miller. Teams participating had a rehearsal on May 15 and May 16 to ready for the races. Teams included: Alpine Elementary School – Keep Calm and Drag On, Alpine Elementary School – Stars and Strokes Forever, Beat Puff Dragon – Cougardragon, Cast & More Crew, Coldwell Banker Residential Brokerage – Coldwell Banker Sparta, Crossfit Skylands, Crossfit Skylands 2, Crossfit Sparta – Jacked and Tan, Dragon Our Tails – Dirty Oars, Dragon Slayerz, Eastern Propane – Team Eastern, Eleanor Young – The Zipplebacks, Friends – Motley Crew, Friends of Sparta – Smoke on the Water, Floating Bricks, Inspire Fitness Inc – Inspire Fitness, Ladies of Sparta – The Thirsty Dragons, Lake Mohawk – Oar We There Yet?, Mohawk Avenue School – Blazing Paddles, NPower, Personal Training LLC – NPower Ninjas, Puff Dragon, RedShed Crossfit – Team RedShed, Robin Flanz – Team Tsunami, RDA Fitness – Paddle faster I hear banjos!, Seneca Lake Club – Dragon our A$$e$, Sleepy Lagoon Beach – OARganized Chaos, Smagalla Family – Fort Apache, Sparta Athletic Club – Team Spartacular, Sparta Friends – Team “Feeling Nauti”, Sparta HS – Sparta Strong, Sparta HS – Sparta Strong 2, Studio at NJSwim – SYNC oar SWIM team fireball, The Jolly Rogers, Twin Hickory Docks – Twin Hickory Rum Runners, Wellness Pediatrics, You’ve Been Schooled and Zumba & More. Spectators packed the Boardwalk for the Dragon Boat Festival. Photo by Jennifer Jean Miller. 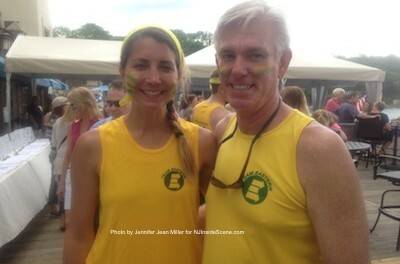 Teams were decked out with spirited face paints and special attire for the event. While the Dragon Boat Festival was in progress, the Fourth Annual Lake Mohawk Tasting on the Boardwalk also took place. Local restaurants gathered on the boardwalk, offering fare for only a few dollars a piece for menu items. 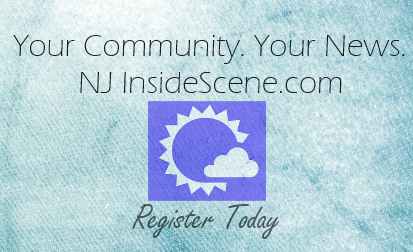 Attendees could purchase a wristband to enjoy the special pricing. All proceeds were donated to “Neighbors Helping Neighbors,” for furnishings for the LMCC Members’ Room and towards a $500 scholarship. The Lake Country Club, which also partnered with the Dragon Boat Festival, had items for purchase. Other restaurants included: Sheridan’s Restaurant, Villa Capri II, St. Moritz Grill & Bar, dre’s, Krogh’s Restaurant & Brew Pub, Ristorante Il Porto and others. 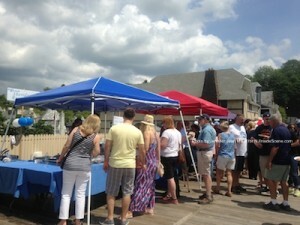 Restaurants lined up to offer some of their fare on the Boardwalk for the Fourth Annual Lake Mohawk Tasting on the Boardwalk. Photo by Jennifer Jean Miller. Click below to see some of the Dragon Boats gliding across the water at the event.